Soodi, M., Hajimehdipoor, H., Akbari, S., Ataei, N. (2017). Screening seven Iranian medicinal plants for protective effects against β-Amyloid-induced cytotoxicity in cultured cerebellar granule neurons. 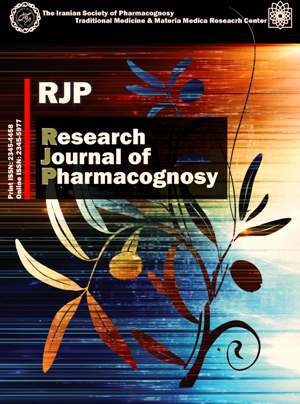 Research Journal of Pharmacognosy, 4(2), 15-22. M. Soodi; H. Hajimehdipoor; Sh. Akbari; N. Ataei. "Screening seven Iranian medicinal plants for protective effects against β-Amyloid-induced cytotoxicity in cultured cerebellar granule neurons". Research Journal of Pharmacognosy, 4, 2, 2017, 15-22. Soodi, M., Hajimehdipoor, H., Akbari, S., Ataei, N. (2017). 'Screening seven Iranian medicinal plants for protective effects against β-Amyloid-induced cytotoxicity in cultured cerebellar granule neurons', Research Journal of Pharmacognosy, 4(2), pp. 15-22. Soodi, M., Hajimehdipoor, H., Akbari, S., Ataei, N. Screening seven Iranian medicinal plants for protective effects against β-Amyloid-induced cytotoxicity in cultured cerebellar granule neurons. Research Journal of Pharmacognosy, 2017; 4(2): 15-22. 1Department of Toxicology, Faculty of Medical Sciences, Tarbiat Modares University, Tehran, Iran. 2Traditional Medicine and Materia Medica Research Center and Department of Traditional Pharmacy, School of Traditional Medicine, Shahid Beheshti University of Medical Sciences, Tehran, Iran. Background and objectives: Alzheimer's disease (AD) as a neurodegenerative disorder is the most common form of dementia in the elderly. According to the amyloid hypothesis, accumulation of amyloid beta (Aβ) plaques, which are mostly constituted of Aβ peptide aggregates, triggers pathological cascades that lead to neuronal cell death. Thus, modulation of Aβ toxicity is the hopeful therapeutic approach for controlling the disease progression. Recently, several studies have indicated promising findings from herbal extracts against Aβ cytotoxicity. The aim of the present study was to assess the protective effect of the methanol extract of seven medicinal plants from Iran on Aβ-induced toxicity in primary neuron culture. Method: The methanol extracts of plants were prepared by maceration method. Primary cerebellar granule neurons (CGNs) were taken from male mice at postnatal days 6-7 and cultured in cell culture medium containing 10% FBS and 25 mM KCl. After seven days in vitro (DIV7), the cells were incubated with aggregated Aβ (10 μM) alone or in combination with different concentrations of extracts in the cultured medium for 24 h and cell viability was assessed by MTT assay. Results: Our results indicated that Sanguisorba minor, Cerasus microcarpa, Ferulago angulata, Amygdalus scoparia and Rosa canina extracts significantly ameliorated Aβ-induced toxicity which indicated the protective effect of these extracts. Protective effects were not observed for Stachys pilifera and Alhagi pseudalhagi extracts. Conclusion: Based on the protective effects of these plants against Aβ-induced toxicity, we recommend greater attention to their use in the treatment of Alzheimer's disease. De-Paula VJ, Radanovic M, Diniz BS, Forlenza OV. Alzheimer’s disease. In: Harris RJ, Ed. Protein aggregation and fibrillogenesis in cerebral and systemic amyloid disease: subcellular biochemistry. Springer, 2012. Auld DS, Kornecook TJ, Bastianetto S, Quirion R. Alzheimer's disease and the basal forebrain cholinergic system: relations to beta-amyloid peptides, cognition, and treatment strategies. Prog Neurobiol. 2002; 68(3): 209-245. Francis PT, Palmer AM, Snape M, Wilcock GK. The cholinergic hypothesis of Alzheimer's disease: a review of progress. J Neurol Neurosurg Psychiatry. 1999; 66(2): 137-147. Deardorff WJ, Feen E, Grossberg GT. The use of cholinesterase inhibitors across all stages of Alzheimer's disease. Drug Aging. 2015; 32(7): 537-547. Barage SH, Sonawane KD. Amyloid cascade hypothesis: pathogenesis and therapeutic strategies in Alzheimer's disease. Neuropeptides. 2015; 52: 1-18. Sun X, Chen WD, Wang YD. Beta-amyloid: the key peptide in the pathogenesis of Alzheimer's disease. Front Pharmacol. 2015; 6(221): 1-9. Cavallucci V, D'Amelio M, Cecconi F. Abeta toxicity in Alzheimer's disease. Mol Neurobiol. 2012; 45(2): 366-378. Kulshreshtha A, Piplani P. Current pharmacotherapy and putative disease-modifying therapy for Alzheimer's disease. Neurol Sci. 2016; 37(9): 1403-1435. Howes MJ, Houghton PJ. Ethnobotanical treatment strategies against Alzheimer's disease. Curr Alzheimer Res. 2012; 9(1): 67-85. Howes MJ, Perry E. The role of phytochemicals in the treatment and prevention of dementia. Drug Aging. 2011; 28(6): 439-468. Russo P, Frustaci A, Del Bufalo A, Fini M, Cesario A. Multitarget drugs of plants origin acting on Alzheimer's disease. Curr Med Chem. 2013; 20(13): 1686-1693. Soodi M, Saeidnia S, Sharifzadeh M, Hajimehdipoor H, Dashti A, Sepand MR, Moradi S. Satureja bachtiarica ameliorate beta-amyloid induced memory impairment, oxidative stress and cholinergic deficit in animal model of Alzheimer's disease. Metab Brain Dis. 2016; 31(2): 395-404. Hajimehdipoor H, Shekarchi M, Aghighi A, Hamzeloo-Moghadam M. Evaluating the acetylcholinesterase inhibitory activity of Ferulago angulata and Ferulago subvelutina. Res J Pharmacogn. 2014; 1(2): 39-43. Esmaeili S, Ara L, Hajimehdipoor H, Kolivand H, Motamed SM. Acetylcholinesterase inhibitory effects of some plants from Rosaceae. Res J Pharmacogn. 2015; 2(4): 33-37. Ferreira A, Proenca C, Serralheiro ML, Araujo ME. The in vitro screening for acetylcholinesterase inhibition and antioxidant activity of medicinal plants from Portugal. J Ethnopharmacol. 2006; 108(1): 31-37. Contestabile A. Cerebellar granule cells as a model to study mechanisms of neuronal apoptosis or survival in vivo and in vitro. Cerebellum. 2002; 1(1): 41-55. Soodi M, Dashti A, Hajimehdipoor H, Akbari S, Ataei N. Melissa officinalis acidic fraction protects cultured cerebellar granule neurons against beta amyloid-induced apoptosis and oxidative stress. Cell J. 2017; 18(4): 556-564. Ferreira ME, de Vasconcelos AS, da Costa Vilhena T, da Silva TL, da Silva Barbosa A, Gomes AR, Dolabela MF, Percario S. Oxidative stress in Alzheimer's disease: Should we keep trying antioxidant therapies? Cell Mol Neurobiol. 2015; 35(5): 595-614. Park H, Oh MS. Houttuyniae Herba protects rat primary cortical cells from Abeta (25-35)-induced neurotoxicity via regulation of calcium influx and mitochondria-mediated apoptosis. Hum Exp Toxicol. 2012; 31(7): 698-709. Ng CF, Ko CH, Koon CM, Xian JW, Leung PC, Fung KP, Chan HY, Lau CB. The Aqueous extract of rhizome of Gastrodia elata protected Drosophila and PC12 cells against beta-amyloid-induced neurotoxicity. Evid Based Complement Altern Med. 2013; Article ID 516741. Ebrahimi A, Schluesener H. Natural polyphenols against neurodegenerative disorders: potentials and pitfalls. Aging Res Rev. 2012; 11(2): 329-345. Karkanis A, Vellios E, Thomaidis T, Bilalis D, Efthimiadou A, Travlos I. Phytochemistry and biological properties of burnet weed (Sanguisorba spp. ): a review. Not Sci Biol. 2015; 6(4): 395-398. Albarracin SL, Stab B, Casas Z, Sutachan JJ, Samudio I, Gonzalez J, Gonzalo L, Capani F, Morales L, Barreto GE. Effects of natural antioxidants in neurodegenerative disease. Nutr Neurosci. 2012; 15(1): 1-9. Mansouri MT, Naghizadeh B, Ghorbanzadeh B, Farbood Y, Sarkaki A, Bavarsad K. Gallic acid prevents memory deficits and oxidative stress induced by intracerebroventricular injection of streptozotocin in rats. Pharmacol Biochem Behav. 2013; 111: 90-96. Ansari MA, Abdul HM, Joshi G, Opii WO, Butterfield DA. Protective effect of quercetin in primary neurons against Abeta (1-42): relevance to Alzheimer's disease. J Nutr Biochem. 2009; 20(4): 269-275. Inestrosa NC, Urra S, Colombres M. Acetylcholinesterase (AChE) amyloid-beta-peptide complexes in Alzheimer's disease; the Wnt signaling pathway. Curr Alzheimer Res. 2004; 1(4): 249-254. Anekonda TS, Reddy PH. Can herbs provide a new generation of drugs for treating Alzheimer's disease? Brain Res Rev. 2005; 50(2): 361-376. Jimenez B, Grande MC, Anaya J, Torres P, Grande M. Coumarins from Ferulago capillaris and F. brachyloba. Phytochemistry. 2000; 53(8): 1025-1031. Bruhlmann C, Ooms F, Carrupt PA, Testa B, Catto M, Leonetti F, Altomare C, Carotti A. Coumarins derivatives as dual inhibitors of acetylcholinesterase and monoamine oxidase. J Med Chem. 2001; 44(19): 3195-3198. Cai Z. Monoamine oxidase inhibitors: promising therapeutic agents for Alzheimer's disease (review). Mol Med Rep. 2014; 9(5): 1533-1541. Li F, Wang ZM, Wu JJ, Wang J, Xie SS, Lan JS, Xu W, Kong LY, Wang XB. Synthesis and pharmacological evaluation of donepezil-based agents as new cholinesterase/monoamine oxidase inhibitors for the potential application against Alzheimer's disease. J Enzyme Inhib Med Chem. 2016; 31(S3): 41-53. Daneshmand P, Saliminejad K, Shasaltaneh MD, Kamali K, Riazi GH, Nazari R, Azimzadeh P, Khorshid HRK. Neuroprotective effects of herbal extract (Rosa canina, Tanacetum vulgare and Urtica dioica) on rat model of sporadic Alzheimer’s disease. Avicenna J Med Biotechnology. 2016; 8(3): 120-125.